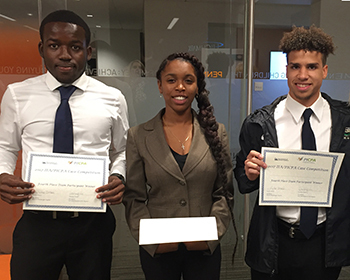 Point Park University accounting student team of Andre Bennett, Adrea Coates and Andre Lowery were named finalists at the Pennsylvania Institute of Certified Public Accountants/Pittsburgh Institute of Internal Auditors Case Study Competition Nov. 2. The competition was held at the headquarters of PNC Financial Services, located at One PNC Plaza - the newest high-rise in Downtown Pittsburgh just steps away from Point Park's campus. "Our case required us to analyze the payroll and personnel business processes for a start-up company using the COSO methodology and then report on significant risks and opportunities related to internal controls," explained Bennett, an accounting junior from Montego Bay, Jamaica. "My main role was to use the COSO framework to highlight the internal control risks within the company," he added. According to Margie Gillfillan, M.B.A., C.P.A., professor of accounting and chair of the Department of Accounting, Economics and Finance and Information Technology, the PICPA/PIIA competition is quite rigorous and receives submissions from undergraduate and graduate programs all over the region. Gillfillan said: "To be selected as a finalist is quite an achievement and to place in the award category demonstrates tremendous talent on the part of our students. We are extremely proud of our accounting students and Point Park's consistent placement in this competition, which recognizes the remarkable skills and career readiness of our students." Bennett added: "Our auditing class provided the foundation for our presentation. Thanks to Professor Gillfillan, we were well prepared for the case! Point Park has opened my eyes to various career opportunities within the accounting profession. I am learning from my accounting professors, who are also CPAs, what I need to do to succeed in the industry."